Exposure to aquatic life encompasses a variety of clinical situations. Dermatologists usually encounter patients with erythema, blisters, wheals, edema, scars, pigmentary changes, and paresthesias (see an example shown below). Whereas the circumstances under which they occur and the distribution of these injuries can be characteristic, most of these lesions are not specific. Mycobacterium marinum infection. Courtesy of the Department of Dermatology, UTMB at Galveston, Texas. Cutaneous exposure to marine life occurs not only in the water but also when encountering living or dead marine animals on the beach. Commercial and recreational activities (eg, commercial or recreational fishing, beach combing, snorkeling, scuba diving, fish processing) have their specific concerns. Note that exposure to aquatic life can accompany various hobbies (eg, the keeping of saltwater fish tanks) or merchandising activities (eg, sellers of fish tank equipment of tropical fish). [1, 2] Exposure to freshwater life can also cause cutaneous injuries, sometimes manifesting with skin lesions similar to those caused by saltwater life. Ingestion of microorganisms can also cause cutaneous manifestations, some of which are of rapid onset. The injuries can be grouped into several general categories. Overlap can also occur (such as when an abrasion also allows a toxin into injured skin or when microbes are inoculated into a puncture wound). Some of the injuries may be accompanied by bleeding and/or functional impairment of the affected area (eg, after extensive exposure to jellyfish tentacles, as shown below). Others, such as injuries followed by the exposure to venoms, can be very mild and self-limited but may also lead to fatal consequences. Jellyfish stings. Courtesy of the Department of Dermatology, UTMB at Galveston, Texas. Wounds become secondarily infected by either debris or microscopic organisms found in the water. Improper wound care (eg, rinsing injuries with seawater possibly loaded with microorganisms) can be a source of wound infections. Inoculation of infectious agents can commonly occur with penetration injuries or lacerations caused by sea urchin spine, stingray, seal bite,  or other bites (eg, octopus, fish). Depending on the depth of the inoculation and on the microorganisms inoculated, severe infections of the underlying tissues and structures can also occur. In addition to possibly evolving into severe systemic infection, such processes may lead to deformities and loss of function. The most commonly encountered phylum in this regard is the Cnidaria. These are animals that exhibit radial symmetry. Their body walls contain a jellylike substance. This phylum includes fire corals, hydroids, Portuguese man-of-war, jellyfish, sea anemones, and true corals. Almost all of these possess nematocysts, frequently on a tentacle. The nematocysts contain a toxin that is injected into the skin. The sequelae of envenomations depend on the species involved, the nature and quantity of the toxin, and the size of the injured person. Cutaneous reactions can be immediate (eg, wheals, vesicles, bullae, angioedema) or delayed hypersensitivity reactions. Complications include pain, postinflammatory hyperpigmentation, scarring, and contractions. Systemic reactions range from mild to severe (eg, cardiac arrest, anaphylactic shock). Two species of box jellyfish around Queensland (Australia) are known to produce venom with hemolytic, dermatonecrotic, and cardiotoxic components. The lesions can be similar to those described in the above categories. Cercarial dermatitis (ie, clam digger's itch, swimmer's itch) is caused by Schistosoma organisms penetrating the unprotected skin. These include, for example, granulomatous processes that may actually be caused by a microorganism (eg, Mycobacterium marinum genome identified in some granulomas). Bites and suction, where the injury is primarily mechanical, are caused by octopus, fish (eg, moray eel, barracuda, triggerfish), sharks, mammals (eg, sea lion, seal), and turtles. Cuts, abrasions, lacerations, and punctures can be caused by any part of the animal that is sharp or pointed, including sea urchins, starfish, stingray, coral, barnacles, broken shells, cone shell, spines of fish fins (eg, surgeonfish, needlefish), and leeches. Inanimate objects can also cause these types of injuries. Contact with toxic substances, including stings and other mechanical injuries resulting in the transfer of a venom, can occur after contact with fire coral, sea cucumber, bristleworm, sea anemone, sponges, stonefish, lionfish, scorpionfish, zebrafish, turkeyfish, catfish, jellyfish, Portuguese man-of-war (see image below), cone shell, starfish, and sea snakes (after bites). Envenomation caused by Portuguese-man-of-war. Courtesy of the Department of Dermatology, UTMB at Galveston, Texas. Mechanical injuries can result in wounds inoculated with microorganisms during the injury or in the course of wound care. Preexisting wounds can provide a readily available portal of entry for marine microorganisms (eg, V vulnificus) even in the absence of fresh trauma. Irritant dermatitis attributed to algae has been described in anglers working with nets. Geographic area, season, and type of activity affect the prevalence of these injuries. With the increase of worldwide traveling, dermatologists may encounter lesions that would otherwise be unknown in their local area. Persons of any race can be affected. Both sexes can be affected. Limited local reactions usually resolve without serious sequelae. Otherwise, prognosis depends on the extent of local and systemic reactions, such as cardiovascular collapse, or functional impairment of the limbs or other structures. Mortality or morbidity depends on the nature and severity of the injury. Infection with Vibrio vulnificus in an immunocompromised host can lead to septicemia and death. Morbidity observed in dermatologic practice includes infection, pigmentary changes, scarring, severe deformities, and loss of function. Children and elderly patients may be extremely susceptible to exposure to venoms. Immunocompromised patients are more vulnerable to systemic infections and life-threatening sequelae. Prevention is important. Instruct patients to protect against re-exposure. Avoid touching marine animals, including beached organisms or animal parts (eg, broken jellyfish tentacles). Use protective equipment such as specially designed gloves when cleaning fish, shellfish, or invertebrates. Wear a wet suit while surfing, snorkeling, or diving. Avoid areas with known high risk of exposure such as shallow coral reefs where sea urchins can dwell. Other methods of avoiding marine life are specific to given geographic areas (eg, walking with a shuffle in shallow water where stingrays may be encountered) and to a particular commercial or recreational activity (eg, fish cleaning). Schmoor P, Descamps V, Bouscarat F, Grossin M, Belaich S, Crickx B. [Tropical fish salesmen's knowledge and behaviour concerning "fish tank granuloma"]. Ann Dermatol Venereol. 2003 Apr. 130(4):425-7. [Medline]. Tong DW. Skin hazards of the marine aquarium industry. Int J Dermatol. 1996 Mar. 35(3):153-8. [Medline]. Haddad V, de Souza RA, Auerbach PS. Marine catfish sting causing fatal heart perforation in a fisherman. Wilderness Environ Med. 2008 Summer. 19(2):114-8. [Medline]. Clark C, McIntyre PG, Evans A, McInnes CJ, Lewis-Jones S. Human sealpox resulting from a seal bite: confirmation that sealpox virus is zoonotic. Br J Dermatol. 2005 Apr. 152(4):791-3. [Medline]. Lippmann JM, Fenner PJ, Winkel K, Gershwin LA. Fatal and severe box jellyfish stings, including Irukandji stings, in Malaysia, 2000-2010. J Travel Med. 2011 Jul-Aug. 18(4):275-81. [Medline]. Carrette TJ, Seymour JJ. Long-term analysis of Irukandji stings in Far North Queensland. Diving Hyperb Med. 2013 Mar. 43(1):9-15. [Medline]. Carrette TJ, Underwood AH, Seymour JE. Irukandji syndrome: a widely misunderstood and poorly researched tropical marine envenoming. Diving Hyperb Med. 2012 Dec. 42(4):214-23. [Medline]. Fleisher JM, Kay D, Salmon RL, Jones F, Wyer MD, Godfree AF. Marine waters contaminated with domestic sewage: nonenteric illnesses associated with bather exposure in the United Kingdom. Am J Public Health. 1996 Sep. 86(9):1228-34. [Medline]. Haddad V Jr, Lupi O, Lonza JP, Tyring SK. Tropical dermatology: marine and aquatic dermatology. J Am Acad Dermatol. 2009 Nov. 61(5):733-50; quiz 751-2. [Medline]. Sud P, Su MK, Greller HA, Majlesi N, Gupta A. Case series: inhaled coral vapor--toxicity in a tank. J Med Toxicol. 2013 Sep. 9(3):282-6. [Medline]. [Full Text]. Onizuka R, Inoue K, Kamiya H. [Red soft coral-induced allergic symptoms observed in spiny lobster fishermen]. Arerugi. 1990 Mar. 39(3):339-47. [Medline]. Valero A, Huguet J, Sanosa J, Malet A, Garcia-Calderon PA. Dermato-respiratory allergy induced by a marine worm (Marphysa sanguinea) used as fishing bait. Ann Allergy. 1989 Jun. 62(6):514-7. [Medline]. Kushawaha A, Mobarakai N, Cooper M, Rose K, Awasum M. Necrotising fasciitis with Vibrio vulnificus: a limb threatening dermatologic complication following exposure to marine life. BMJ Case Rep. 2010 May 6. 2010:[Medline]. [Full Text]. Mizuno M, Nishikawa K, Yuzawa Y, et al. Acute renal failure after a sea anemone sting. Am J Kidney Dis. 2000 Aug. 36(2):E10. [Medline]. Auerbach PS, Hays JT. 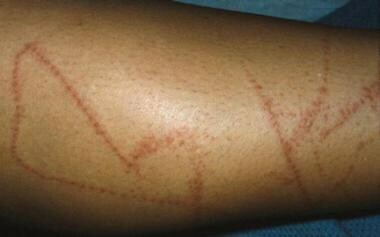 Erythema nodosum following a jellyfish sting. J Emerg Med. 1987 Nov-Dec. 5(6):487-91. [Medline]. Yamamoto R, Suzuki M, Hori S, Aikawa N. Stonefish "Okoze" envenomation during food preparation. Keio J Med. 2010. 59(1):19-22. [Medline]. Darlene FO, Phee-Kheng C. Hot water immersion as a treatment for stonefish sting: A case report. Malays Fam Physician. 2013. 8 (1):28-32. [Medline]. Atkinson PR, Boyle A, Hartin D, McAuley D. Is hot water immersion an effective treatment for marine envenomation?. Emerg Med J. 2006 Jul. 23(7):503-8. [Medline]. Barnett S, Saggiomo S, Smout M, Seymour J. Heat deactivation of the stonefish Synanceia horrida venom - implications for first-aid management. Diving Hyperb Med. 2017 Sep. 47 (3):155-158. [Medline]. Cummins DL, Delacerda D, Tausk FA. Mycobacterium marinum with different responses to second-generation tetracyclines. Int J Dermatol. 2005 Jun. 44(6):518-20. [Medline]. Wallace RJ Jr, Wiss K, Bushby MB, Hollowell DC. In vitro activity of trimethoprim and sulfamethoxazole against the nontuberculous mycobacteria. Rev Infect Dis. 1982 Mar-Apr. 4(2):326-31. [Medline]. Erysipeloid. Courtesy of the Department of Dermatology, UTMB at Galveston, Texas.